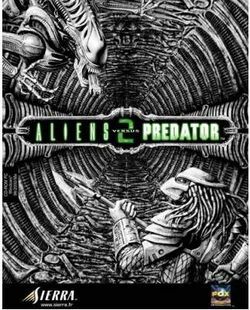 Aliens versus Predator 2 is a video game developed by Monolith Productions and published by Sierra Entertainment, which was released through Fox Interactive in 2001. The game is a sequel to Aliens versus Predator, which is based loosely on the movies of the Alien and Predator series. Similarly to the previous game, it is a first person shooter (FPS) that uniquely gives the player a choice of three characters/species, each with their own distinct set of weapons and abilities. These factions include the Alien, Predator, or Colonial Marines. The storyline features a fourth non-playable side called the Iron Bears or "Corporates", human mercenaries with Marine weaponry who provide security for the Weyland Yutani Corporation; the Corporates are the playable fourth choice in multiplayer. Sierra released an expansion to the game titled Aliens versus Predator 2: Primal Hunt in 2002. MacPlay ported Alien versus Predator 2 to Mac OS X on June 30, 2003. Initially it did not support online multiplayer for Macs running Mac OS 10.3 or newer, however an unofficial patch was released which fixes the problem. The game does not work with Leopard (10.5). The Gold Edition was released over a year after the original game. It combines the original game with the Aliens versus Predator 2: Primal Hunt expansion pack. This page was last edited on 29 May 2016, at 18:14. This page has been accessed 10,000 times.